"Kid, don't bug me! ...Cant you see I'm busy? ...Take your little two cent problem and go someplace else!" As remembrance flowed into my mind, slowly my attitude changed about this boy and his problems. My feelings of impatience and apathy were replaced by humbleness and understanding. So I looked back over at the kid, gave him a smile and said, "Son, what's your name?" He said, "C.J." So I put my paperwork down, set my clipboard aside and said, "Well C.J., let's you and me go over to Bucky's house!" "Well Sarge., ...it was like this..."
“...As I looked at her body, I realized that if the bullet came as a surprise as the husband said it did, it would have struck his wife in the left side of her head. I knew that the only way she could have been shot in the back of the head was if she was turning and looking over her right shoulder, or if she was looking away from the gun barrel that was pointed at her. In looking at the placement of the shot, the trajectory of the bullet and the height of the Blazer, I knew there was no way the bullet could have come from a passing sedan into the high riding Blazer and then struck his wife who was on the passenger side of the Blazer. And because there were no bullet holes in the Blazer and only one open window, the bullet either came in through the window, or it came from the only other occupant in the Blazer. The more I looked, the more I realized that this man was a liar and a murderer. I knew there was no black sedan and no drive by shooting. There wasn’t a doubt in my mind that this guy had just murdered his wife. “...I should never have received that call that night. I may never know how it came up on my computer screen. But I do know that it was our Father in Heaven that sent it to me. One of His daughters was desperately in need of help. She needed counsel from the Lord and she needed a hug. The Lord, through His servants in the priesthood, provided both. He put His arms around her in a way that only God could and gave her counsel from a loving Father through the mouth of His Priesthood. Through two humble cops on their way to a call. “...As I stood there just holding the flashlight and watching him die, I couldn’t help but think how doubly sad this really was. Doubly sad because not only was this young man going to die before his time, but in the last few moments of his life, there was no family here for him. There weren’t even any friends here for him. Just a bunch of guys who didn’t even know his name. I knew that if we couldn’t identify him, that this mother’s son would be buried as, John Doe, 1996, Maricopa County, number 15, or whatever. I had watched people die before, but this time it seemed different. As I stood there watching his life slip away, I thought about how much I love my family. How much I love my son, and how grateful I was that I was not standing there watching my son die. “...One night while on patrol, I was dispatched to a report of “suspicious activity.” The call soon appeared on my squad car’s computer screen. The comments read, ‘An elderly woman and her ten year old grandson saw objects flying through their living room while they were watching television together and there was no one else in the home.’ I was immediately intrigued with the information surrounding this call as I anxiously and curiously went on my way to this, my first ever, possible encounter with GHOSTS??? I was wearing the hat of a GHOSTBUSTER!!! “...As I walked him to the patrol car, he sobbingly said, ‘This isn’t fair. I’m not the guy you are looking for, but because you came here looking for him and I have a few things in my past that I’m trying to get away from, the guy you’re looking for goes free and I go to jail.’ He was weeping and he said it so convincingly, it was hard for me not to believe him and even feel sorry for him. While at the department, he asked if he could use the bathroom. He seemed like he was taking a long time in there so Jayln went in after him. Suddenly Jayln realized that his fingertips were bleeding. He had bitten several small chunks of flesh out of six of his ten finger pads so as to prevent himself from being identified. However, he still had four fingers that he hadn’t gotten to yet. From those four remaining fingers, he was printed and identified by a lazar printer and computer searching system. He was in fact, the suspect we were looking for. He was so convincing, so polite and seemed so sincere, that at first and even throughout, we had a hard time believing he was the suspect we were looking for. It was only because we latched onto him and kept investigating him, that we finally found him out. That is the point with the anti-Mormon propaganda engineers too. They seem so convincing, so polite and so sincere, that at first and sometimes even throughout, it is hard to believe that they could be lying. Yet time and time again, when I latched onto them and continued to investigate them, like the suspect on 3rd Ave, I found each and every one of them out. was convincing the world he didn’t exist. “...Still other people can’t accept the fact that God would have gone to such a common person as Joseph Smith. However, God picking a common person for His work is not inconsistent either. When God chose the slayer of Goliath and the leader of the Jews, He didn’t choose the mightiest man in Israel! He chose a young shepherd boy. When God needed a prophet in Moses’ time, He didn’t go to Pharaoh or any recognized religious leader of the day. When God chose a successor to Moses, He chose Joshua. A commoner and a former slave. When God chose the birth place of His Only Begotten Son, He didn’t choose a king’s bed in a king’s mansion. He chose a manger in a stable. When God chose the earthly father of Christ, He didn’t choose an earthly king, He chose a carpenter. When Christ chose His apostles, He didn’t choose any of the Pharisees, He chose fishermen. In fact, Joseph Smith fits the historical profile of God’s servants. Picking someone like Joseph Smith to be the prophet, is more consistent with the way the Bible showed God did things, than inconsistent. Christ didn’t select his servants from among the wealthy, the popular or even the highly learned. Everyone He chose shared three common denominators. They were the pure in heart, they were willing to do what was right and they loved God. The anti-Mormon literature that I have read contains examples of both good and bad propaganda techniques. In choosing which topics to investigate with you, I selected what I felt were the most popular topics targeted by anti-Mormons. I selected their “Grade A” evidence. As I said before, not all anti-Mormon literature is inaccurate. Some of their literature is accurate. But most of it vacillates between good and bad quality propaganda. I will show you examples of both and I will show you how to recognize the difference and the techniques used. I will also show you some accurate anti-Mormon statements, as well as some very interesting propaganda techniques that I have found throughout all of the anti-Mormon literature writers I have read. “...Occasionally, an officer will lose an arrest in court, because of sympathy from the jury, sympathy from the judge, or because the officer didn’t build his case strong enough to stick. So I’m willing to say that could have happened to Joseph Smith as well. Let’s say that he was lucky, and quite often he had incompetent arresting officers, inept prosecutors, witnesses that failed to show up for trial, and sympathetic judges. If that were quite often the case, how many times of the thirty-seven times could Joseph Smith reasonably expect to get off from the charges? Ten percent of the time? If we give him the benefit of the doubt and say that happened fifty percent of the time, what about the remaining fifty percent? That still leaves eighteen arrests unaccounted for. Think about this: Regardless of the person we are talking about, there are only three possibilities why anyone could be arrested and acquitted that many times. One: The entire law enforcement team, from investigating officer, prosecutor, jury and judge for all thirty-seven incidents, were inept, with the total inability to make their cases stick. Three: The arrestee was a victim of extreme prejudice. “...The point is this, The Book of Mormon has influenced millions. It is the cornerstone of a restored Christian religion that is over 150 years old. The Church’s numbers continue to increase and in fact, it is possibly the fastest growing Christian religion. The Church is worldwide. Many highly skilled and learned men subscribe to it and have borne testimony to the world of its truth, and have even given their lives for it. Thousands of parents spend their own money to send their sons and daughters into the world to tell others about it. Yet, it’s argued that Joseph Smith was just an author and the Book of Mormon is just a product of nineteenth century? It’s just religious imagination? That is so illogical, it’s incredible! If Joseph Smith is just an author, then why hasn’t any other author been able to duplicate what he did? Think about it! There are only two logical possibilities. Two: His story is true. The sheer, overwhelming preponderance of the evidence eliminates any other possibilities. Either Joseph Smith is the greatest genius by far, having authored the greatest book the world has ever seen and he pulled the greatest scam the world has ever seen, ...or... his story is true. “...I never had any knowledge of such a place. I was so overcome, that I fell on my knees. Tears came streaming down my face. Elder Hugh B. Brown met me at the top of the three steps. ‘Come in. I have been expecting you’ he said. That’s when I flooded the reception area. I know that I truly had the gift of the Holy Ghost. I spent three very special days with Elder Brown. He was at the time, Mission President and Church Coordinator to service men. Elder Brown pronounced a special blessing upon me. If I would keep the commandments, I was promised that I would survive and come home, raise a wonderful family and have a very special life. I took part in every campaign in Europe. I had many special assignments. I had many close encounters. After the war was over, I did enjoy those promises. who had taken part in every campaign in the European Theater. “...As a soldier, I could tell you how it is to watch a man dissolve in front of your eyes in a sheer second....I have seen a man burn from phosphorous and watched as his skin melted away. I have watched human beings shoot drugs, overdose and then die from them. I have seen human beings be maimed beyond belief. I have been scared in different times of my life of being enacted upon by danger, that I actually thought I would die. I’ve listened to my heart physically pound against my chest from fear and thought it would explode. but how tough you allow yourself to be at the right time. “...A tough person is one who kneels down to a child, one who hugs the needy, one who helps the meek and mild. A tough person is one who kneels down with his family in prayer, praying for others and for his own forgiveness when needed. Thanks to the help of my Heavenly Father, I have been shaped and reshaped and molded into a brand new me: Brother Tough Guy. One that I now respect and always deep down inside, wanted to be. Yes Allen. Even for him He was crucified. I can still remember staring down the barrel of her gun. I can still remember seeing that cylinder loaded with bullets. I was close enough to see that the bullets were hollow points. If she fired, there would be no way she could miss me! “...Police officers are trained to instantly react to life threatening situations. Not to stop and think about them. So without thinking, I did as my training had taught me. I drew my weapon, stepped behind a door jam for cover while instantly picking a clear front sight and began to squeeze the trigger to counter the threat before me. What happened next, I did not expect. A clear voice and feeling came to me that she would not shoot. of my weapon and that I was in no danger as she would not shoot me. than all the years in the convent. “...As I was pulling into the parking lot, Mark radioed that the guy was getting into his car and leaving. I told Mark I was behind him and he could make the stop any time he wanted. Mark turned on his overhead lights. The guy failed to yield so Mark hit his siren. The suspect then simply took off. Mark and I sped after him. The suspect sped northbound. 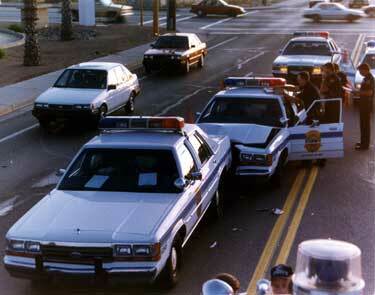 Another officer had set up a one car roadblock but the guy drove around the police car. The time was about 1500 and there were a lot of kids getting out of school and walking the streets, so I made the decision to cut his escape route and stop the pursuit. I cut through a parking lot and stopped my patrol car in the middle of University blocking all lanes that weren’t already blocked by traffic. I looked in his direction and saw him turn the corner toward me. I heard the roar of that big Plymouth engine as it sped toward me. was the last thing I heard and saw. “...As I silently prayed and tried to forget the helpless feeling I had, I felt to give Russell a Priesthood blessing. I asked the paramedics and the bystanders, ‘Is anyone here LDS?’ There was no response. Suddenly I knew what to do and I did it. I climbed up onto the trunk of the mangled vehicle and reached in through the broken rear window. I placed my hands on Russell’s head. He had just lost consciousness. As I followed my feelings, I was so thankful that in this time of my helplessness, there was somewhere, someone to turn to. The words I spoke came without hesitation and the noise and confusion of the deadly scene seemed distant for a moment. I pronounced a blessing of comfort on Russell’s head and asked the Lord to take this son into His own care and to preserve Russell’s life, if that were His will. As I finished, he was finally freed from the tangled wreck and I helped to wheel the gourney to the waiting helicopter. “...Sometimes, we the police, ask if family, neighbors or clergy can be called to assist people in times of loss but that wasn’t necessary here. I was all that she needed and the Lord provided all that I needed. I truly thank my Heavenly Father for His masterful help. After perhaps thirty minutes, we made that call to Tucson PD and we made it together. I know she will never be alone again. For a couple of years, while I was still with Globe PD, I received birthday cards and I know it was her way to say thanks and to commemorate her daughter’s birthday. but sometimes comes from the experiences of others. Experiences both good and bad. “...The guy was very upset and distraught. He began asking us what religion we were. The first three officers he asked were Catholic. He stopped after his third time. As he talked to us I got the feeling he was LDS. Dan was beside me and he got the same feeling. We talked and felt we might have a better chance at reaching him. The young man’s name was Bill. He was twenty-three...I’m a pretty poker faced guy. Emotion doesn’t show through very easy. But now, it was hard for me to keep my emotions from showing through. My trigger finger had become numb at the first joint because I had been putting pressure on the trigger for over an hour and a half. He moved around while talking and stretching. When he did, the muzzle of his gun pointed at me at least twice. I could have legally shot him on several occasions, but morally, I just couldn’t shoot him. I was afraid if any of us shot, it would cause an instant chain reaction among the seven officers there and all seven of us would have shot. He wouldn’t have stood a chance. So I waited and prayed. I didn’t want to kill this young man. I would try almost anything to save him. He looked at me and I saw tears well up in his eyes. I was saying in my mind, ‘Don’t make us kill you’. “...On her birthday, September 24th, 1966 she was baptized and so was I and two of my sisters. After another year of studying and praying about the gospel, my dad developed his own strong testimony of the truthfulness of the gospel and he too was baptized. My parents have raised all of us girls in The Church of Jesus Christ of Latter-day Saints. They have led through example and their testimony of the Church is strong. Since that day, between my family and extended family, there are over fifty members of The Church of Jesus Christ of Latter-day Saints. “...His failure to respond this time would have resulted in his physical removal and or arrest. But at that, he slowly closed his Bible, rose to his feet and then he slowly turned and looked at me. Even though my stern facial expression never changed, the look he gave me melted my heart. I was no longer an angry man, ready to do battle...In the eyes, the windows to his soul, I could see that this guy was a very sad and very, very, lonely man. I could also tell that this guy’s mind had stopped keeping up with his body a long time ago. This guy wasn’t a man, he was just a boy. A very young boy. Hey man, haven’t you heard the good news? Don’t you know that families can be families forever? He watches over you. And I know that He allows your mother to watch over you, even still. So on those nights when you’re cold and all alone, and there is no friend for you, remember that your mother loves you. That she watches over you. “...I was scared. So I knelt down and offered a fervent prayer to my God in the name of my Lord and Savior, that I be directed out of the woods. After the prayer, I stood there and listened for the prompting of the Holy Ghost, to give me the direction I had asked for. As I was standing there waiting for the prompting, I contemplated the consequences. I knew I was totally lost. It wasn’t a matter of choosing north or south or east or west, because I had no idea where any of those directions were. It was a matter of choosing one degree out of a 360 degree circle. I knew the odds of ending up deeper into the forest were far, far greater than being able to find my way out. Suddenly and peacefully the feeling came. I looked in the direction I was to go and I lined up three trees that were about fifty feet apart. Trees don’t grow in a perfectly straight line and there were so many trees, but I never took my eyes off the three trees I picked out. I walked to the first tree and then picked out another third tree that lined up as much as possible with my first two trees. I walked to the next tree and picked out another third tree. I always had two or three trees lined up and I never looked left or right. After a while, I came to a road. I looked to my left and saw nothing. I looked to my right and about sixty yards up the road was my brother-in-law’s 77 blue Ford truck. The Lord will guide you out of the forest as well. Yet, He will not take away your free agency either. The decision to search for the truth, has to be yours. and He will speak to you too, Spirit to spirit. Following the Spirit of God is like following a compass in your hand. When you first take it out of your pocket, the needle wobbles around, moving back and forth as it struggles to find north. But with each swing left to right, it moves less and less until the needle finally “zeros-in” on true north. Following the Spirit is the exact same. At first, your feelings are wobbly. They move back and forth, struggling to find truth. But with each swing left to right, your feelings move less and less until finally you zero-in on truth. The only difference with your spiritual compass is that you can’t see the needle. You have to feel it. When things have seemed their darkest for me, there has always been a certain feeling deep inside me that has let me know I wasn’t alone. It’s a feeling, a certain feeling, that I know if I will follow it, I will not be wrong. It’s my spiritual compass and I know for a certainty that that compass we hold inside us is as true as the compass we hold in our hand. that you feel in your heart. It’s a strange, ...yet familiar confidence. free of frustration and doubt. A feeling that you are not alone. Suddenly you feel connected to some kind of energy that lifts you spiritually. An energy that you can actually feel in your bosom. The words latter-day, merely mean our day. The word Saints is used as it is used in the Bible. It means followers and believers. We are the followers and believers of Jesus Christ. If you have a strong love for your Lord and Savior, Jesus Christ, then sooner or later you will see it too. Not because we are right and you are wrong, but because Jesus Christ is a God of order and He really does have one true church. And sooner or later, your love for Him will overcome your stubbornness and you will seek the truth for yourself. God lives and so does His Son, Jesus Christ. They are not Gods of confusion and they are not on separate paths. They are as one, as the Scriptures say they are. They have one true path for us to follow. It is there for the seeker to find it. Don’t be afraid. Trust Them. Seek the truth.